In a "presser" released back in November of last year(2009) A&E announced a new reality show titled "Strange Days" hosted by none other than Bob Saget. The press release continues on..
..."Bob Saget's Strange Days" will enable viewers to get an insightful understanding of what makes individuals tick in these alternative lifestyles and daring situations. Bob will also uncover the humanity and the shared values inside all of these odd and absurd situations that each of us will be able to relate to." Looks like filming has begun and one of the episodes will cover Bigfooting. Our good friend Cliff Barackman has the scoop on his blog, North American Bigfoot. We insist you read the whole story on there, but first, allow us to whet your appetite with a teaser paragraph. 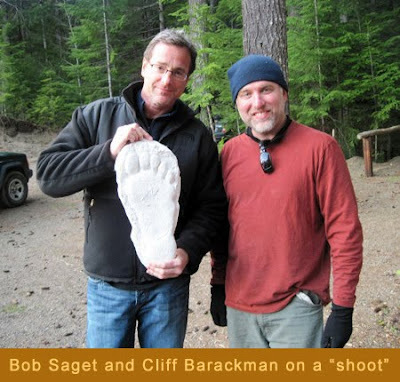 In his post, Cliff Barackman shares Bob Saget's interest and reactions to to being on a Bigfoot Expedition. "Bob accompanied several of us on a night walk on Friday night. He was mesmerized by the night vision technology that we use in our quest for footage, passing the units around to all the crew members even if it meant they needed to temporarily drop their cameras. He was amused by our efforts to call to sasquatches, but highly respectful at the same time. In fact, his attitude throughout was one of respect for us. I expected him to heckle us a lot more than he did." Fans, you absolutely need to read the rest of this at the link provided below. Cliff provides more stories and more photos at his blog. 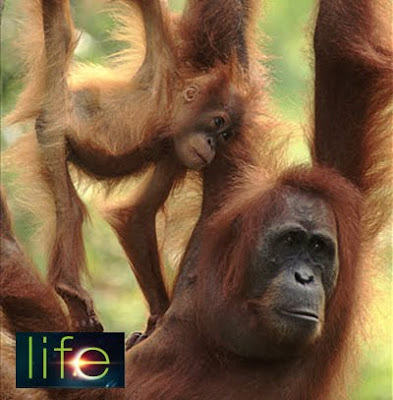 The Planet Earth series was amazing, Blue Planet was spectacular, but Discovery Channel’s newest series, LIFE, is just plain unbelievable. 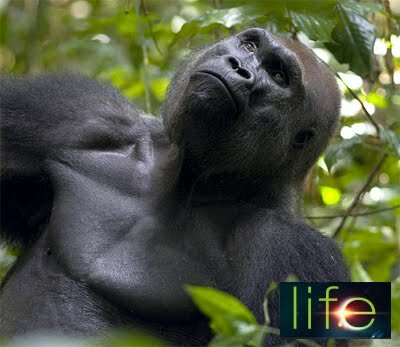 LIFE is an 11-part Discovery Channel series In collaboration with BBC, exploring the animal kingdom. It took over 3,000 days to film, and captures animals hunting, breeding, evolving, and living. It is narrated by Oprah Winfrey, and will air perhaps the most exciting episode tomorrow night at 8PM. The Episode, Primates, will focus how intelligence, adaptability and resourcefulness help primates beyond their physical means, and thrive in a variety of habitats. Any lover of Bigfoot or Sasquatch is guaranteed to gain insight into this elusive beast by watching tomorrow night's episode. Below is a promotional video on the entire series. The BBC reports a Victorian museum collection selling over five hundred items including more than 200 taxidermy pieces that have sold for more than £280,000 at auction. The collection included stuffed dead animals and others made to look like mythical creatures. 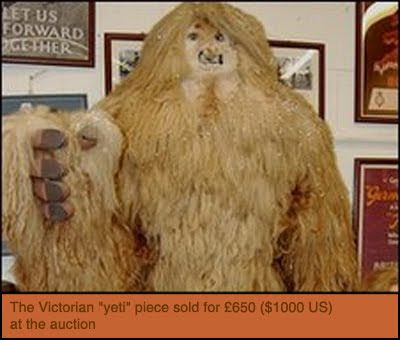 A giant stuffed tortoise fetched the most at £6,000, a "unicorn" sold for £2,800 while a "yeti" went for £650. Other items in the sale included a mermaid, a hare with antlers (jackalope?) and a cat with wings. In Victorian times, taxidermy - the process of stuffing dead animals and placing them in lifelike poses - was very fashionable. Matthew Denney from the auction house said: "There are still some collectors out there who want to buy this sort of thing, and it's a way of appreciating the natural world and the lions and zebras are very beautiful, beautiful creatures. "You don't normally get the chance to see these items up close. The level of interest has been huge."